9. And the Heaven Falls . . .
Heavenfalls is a female-fronted metal band from Brazil and can be described as a progressive power metal band with influences from progressive metal, power metal and 80’s metal. The band consists of Sabrina Carrión (vocal), VictorMontalvão (guitar), Pedro Mota (guitar), Carlos Jannarelli (bass), José Luiz Faulhaber (keyboards) and Rodrigo Fontoura (drums). In 2003 the band releases their first full album called “Ethereal dreams” through Hellion Records. Due to its success, Heavenfalls is invited to support Iron Maiden 2004 gig in Rio de Janeiro/Brazil. 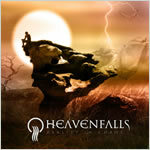 In 2005 Heavenfalls celebrates the year with the release of the second album "Reality in Chaos" also through Hellion Records and with great gigs next to the bands Shaaman, Evergrey and Pain of Salvation. In 2006 when they start to compose new songs for their 3rd album toreleased at the end of 2007. The heaviness and the tradition of Classic Heavy Metal powered by a modern production signed by Sidney Sohn (Andralls, Thoten): this is the face of Heavenfalls after the release "Reality In Chaos" in 2005. The new line-up consisting in Sabrina Carrión (vocals), Victor Montalvao (electric & acoustic guitars), Jose Luiz Faulhaber keyboards/synthesizers), Pedro Mota (eletric & acoustic guitars), Carlos Jannarelli (bass), and Rodrigo Fontoura (drums), achieved a new high: an album that overcame its sucessfull predecessor Ethereal Dreams (2003) and supplied the big expectations generated by it. Experienced, the band brings some historical moments in their luggage, like the remarkable show with Iron Maiden in Rio de Janeiro in front of 7.000 people (Claro Hall, 2004), the gigs with Evergrey and Pain Of Salvation during their South American tour, and the performance with Shaaman playing to more than 1.000 avid spectators at Circo Voador in 2006.